The Hilton hotel has opened the newly refurbished development Society Business Park on Cairo road in Lusaka, Zambia. The 20-floor mixed-use park, which also houses Hilton Garden Inn, was part of a public-private partnership agreement between Zambia National Building Society (ZNBS) and the National Pension Scheme Authority (NAPSA) in 2011. 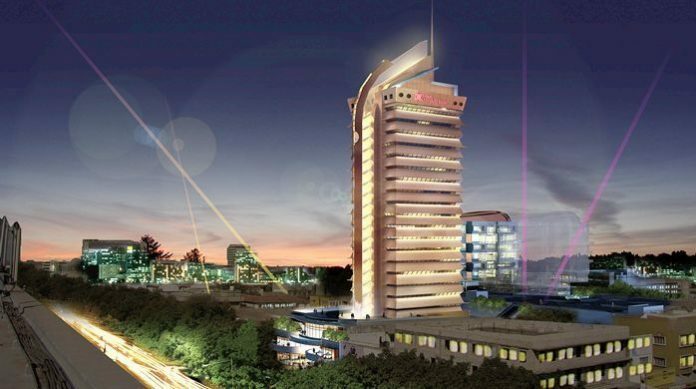 The agreement between the two is a 20-year procurement partnership for the US $100m redevelopment of the park, which its management was subsequently awarded to Hilton to open the Hilton Garden Inn as part of the development. With 148 guest rooms, the hotel offers its guests panoramic views of the capital, including four junior suites with kitchenettes on the 18th floor. It also has an all-day dining restaurant catering to both leisure and business travelers. The hotel also features contemporary indoor and outdoor spaces, including 1,600 square feet of banquet space and pre-function areas. General manager Kudzayi Nheweyembwa said the hotel is strategically situated as it is in close proximity to numerous restaurants, shops and offices. Other features include an outdoor pool, and a 24-hour fitness centre. “We are in close proximity to numerous restaurants, shops and offices so both leisure and business travelers will be met with a stay tailored to their needs and we look forward to welcoming them with our bright and happy service,” he said. Hilton vice-president for Africa and the Indian Ocean, Mr. Jan van der Putten on his part said the hotel had great potential in promoting tourism and business. “I am confident that Hilton Garden Inn Lusaka Society Business Park will contribute to the growth of the tourism sector as well as create employment opportunities. What we are witnessing today is part of our strategic five-year expansion plan for Africa,” he said. Zambia’s Minister of Labour and Social Security Joyce Nonde-Simukoko said Hilton’s investment demonstrated confidence in the Zambian market. “This investment has transformed the outlook of Lusaka’s central business district by adding the much needed modernity to infrastructure.It is my government’s wish that other property owners in the central business district will be motivated to give a face lift to their buildings,” she said. The hotel is the second Hilton Garden Inn property to open in sub-Saharan Africa this year and joins 42 existing Hilton properties in Africa.